This heavy duty pyramid climbing plant frame is suitable to support for the heaviest of climbing plants. These rose obelisks are ideal for adding height and back ground colour to the garden borders or large plant containers, a great addition to any garden for added focal point. This obelisk trellis is free standing and manufactured from heavy duty steel rod produced as a one piece sturdy structure and finished with a matt black powder coating to offer years of protection from weather and rusting. 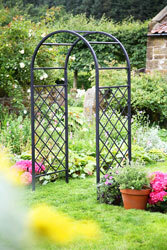 This garden frame for climbing plants features elegant scrolled design with pointed finial top. This heavy duty pyramid climbing plant frame is suitable to support for the heaviest of climbing plants. These garden frames are ideal for adding height and back ground colour to the garden borders, a great addition to any garden. This plant rose obelisk is free standing and manufactured from heavy duty steel rod produced as a one piece sturdy structure and finished with a matt black powder coating to offer years of protection from our climate weather conditions. This garden frame for climbing plants features a classic styling design with a large solid finial ball. This extra tall heavy duty pyramid climbing plant frame is suitable to support for the heaviest of climbing plants. These large, durable garden frames are ideal for adding height and back ground colour to the garden borders, a great addition to any garden. This plant rose obelisk is free standing and manufactured from heavy duty steel rod produced as a one piece sturdy structure and finished with a matt black powder coating to offer years of protection from our climate weather conditions. This garden support obelisk for climbing plants features a classic styling design with a large solid finial ball. This British made garden obelisk is manufactured and designed in the UK from heavy duty steel with welding to exacting standards. 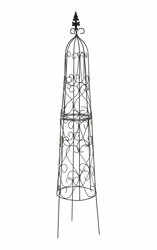 This steel garden pyramid features a large finial flame for maximum impact in your garden borders. This heavy duty diamond garden obelisk is made from two sections which bolts together which 2 nuts and bolts in seconds. Black powder coating has been applied to steel to prevent weathering and prevent any rusting. 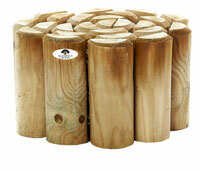 This durable and stable design obelisk will offer excellent support to most climbing plants. This British made garden obelisk is manufactured and designed in the UK from heavy duty steel with welding to exacting standards. 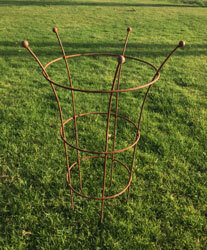 This metal garden pyramid features a large finial flame for maximum impact in your garden borders. This diamond heavy duty garden obelisk is made from two sections which bolts together which 2 nuts and bolts in seconds. Black powder coating has been applied to steel to prevent weathering and prevent any rusting. 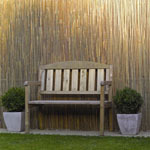 This classic and timeless design will offer support for many climbing plants for year to come. This obelisk is new for 2016 with the consistency of the other handcrafted obelisks; this garden obelisk offers styling with a striking design and pronounced Peak. This large obelisk plant support adds form and prominence to any garden border. 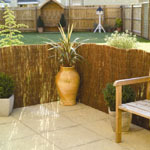 Constructed and assembled in East Yorkshire from heavy duty solid steel rod and then coated in black PVC membrane with will offer protection against weathering and rusting. Click here for larger image.. This obelisk is new for 2016 with the consistency of the other handcrafted obelisks; this garden obelisk offer styling with eye-catching design and pronounced Peak. 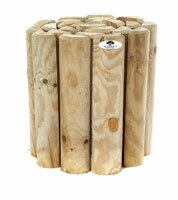 This decorative plant obelisk adds structure and eminence to any garden boundary. Constructed and assembled in East Yorkshire from heavy duty solid steel rod and then coated in black PVC membrane with will offer protection against weathering and rusting. This obelisk is new for 2016 with the consistency of the other handcrafted obelisks; this garden obelisk offers styling with a stunning design and pronounced Peak. This garden trellis pyramid obelisk adds framework and prestige to any garden perimeter. Fabricated and assembled in East Yorkshire from heavy duty solid steel rod and then coated in black PVC membrane with will offer protection against weathering and rusting. Pack of all three of these Aston Obelisks (1.75m, 2m and 1.5m). 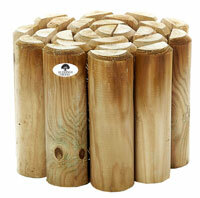 These obelisks group in your garden border will give a massive impact. All these obelisks offer styling with a stunning design and pronounced Peak tops. All three of these obelisks are fabricated and assembled in East Yorkshire from heavy duty solid steel rod and then coated in black PVC membrane with will offer protection against weathering and rusting. This large obelisk is new for this year. 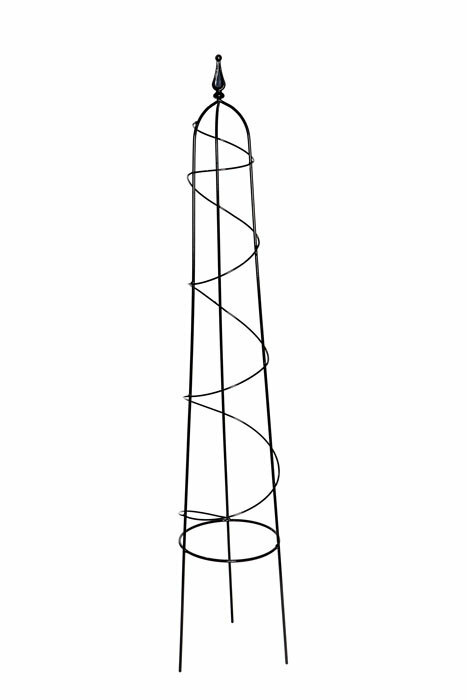 This garden obelisk offers elegance with upright steel rod with three encircled rings and four balls topped. This garden obelisk adds structure and impacted to any garden perimeter. Assembled and produced in East Yorkshire from heavy duty solid steel rod and then coated in black PVC membrane with will offer protection withstand weathering and rusting. This medium obelisk is new for this year. This garden obelisk offers charm with upright steel rod with three encircled rings and four balls topped. This garden obelisk adds structure and prominence to any garden perimeter. Fabricated and assembled in East Yorkshire from heavy duty solid steel rod and then coated in black PVC membrane with will offer protection resist weathering and rusting. This small obelisk is new for this year. This garden obelisk offers styling with upright steel rod with three encircled rings and four balls topped. This garden obelisk adds structure and height to any garden perimeter. Fabricated and constructed in East Yorkshire from heavy duty solid steel rod and then coated in black PVC membrane with will offer protection prevent weathering and rusting. Pack of all three of these Aston Obelisks (1.5m, 1.4m and 1.2m). These obelisks group in your garden border will give an impressive display. All these obelisks offer styling with a stunning design and 4 ball topped.. All three of these obelisks are fabricated and assembled in East Yorkshire from heavy duty solid steel rod and then coated in black PVC membrane with will give protection against weathering and rusting. This spiral design obelisk is new for this year. This spiral detailed garden obelisk offers styling with a stunning design and pronounced Peak. This garden trellis pyramid obelisk adds impacted and prestige to any garden perimeter. Fabricated and assembled in East Yorkshire from heavy duty solid steel rod and then coated in black PVC membrane with will offer protection against weathering and rusting. This garden obelisk will give your garden a stunning feature with this impressive shaped obelisk. This garden trellis pyramid obelisk adds impacted and prestige to any garden perimeter. Fabricated and handcrafted in Yorkshire from heavy duty solid steel rod and then coated in black PVC membrane with will offer protection against weathering and rusting. 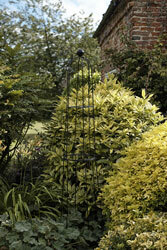 This heavy duty plant flame design obelisk is suitable to support for the heaviest of climbing plants. These large plant supports are ideal for adding height, impact and back ground colour to the garden borders or large plant trough planters. 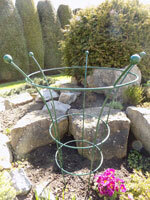 This climbing plant support frame is free standing with six legs making a sturdy obelisk. Manufactured in Great Britain from heavy duty round 8mm steel rod, finished with a matt black powder coating to offer years of protection from weather and rusting. This planter obelisk is designed for use in garden planters and containers, ideal for offering support to smaller climbing plants. Perfect as a pair to frame the entrance to your front door. Constructed and handcrafted in Yorkshire from heavy duty solid steel rod and then coated in black PVC membrane with will offer protection against weathering and rusting.